Have there been any new additions or faculty changes to your program within the last year? Dr. Siba Haykal left the faculty at the start of 2018 to return to the University of Toronto. Dr. Kristen Rezak has departed to join the faculty at Duke University. We were fortunate to have had them both on our faculty and look forward to their continued success in the future. Three new surgeons have joined the faculty. Dr. Christie Bialowas joined us from the faculty at the University of Texas – San Antonio. While she was there she won numerous prizes for her dedication to teaching both residents and medical students, and we are excited about her contributions to this in Albany. Saratoga, NY native Dr. Casian Monaco joins us to lead our expansion in breast reconstruction services at our affiliated institution, Saratoga Hospital. Dr. Monaco completed his residency at NYU, and a microsurgery fellowship at UCLA. Dr. Joseph Ricci who joined us after completing residency at Harvard University and microsurgery fellowship at NYU has been appointed Director of Clinical Research. Have there been any developments/changes within your division/department within the last year? Dr. Patel has succeeded Dr. Malcolm Roth as Chief of the Division of Plastic Surgery. Dr. Patel is currently continuing as residency program director, and we look forward to continued growth of the division and residency program under his leadership. Has your program held any events or hosted any speakers over the past year which you would like to share with your colleagues? Are there any coming up in the fall or winter? We hosted Dr Julie Park of the University of Texas Medical Branch Galveston and Dr Larry Gottlieb of the University of Chicago earlier this year. Dr Richard Korentager, Chair of Plastic Surgery at the University of Kansas will be visiting in September 2018. He is the visiting speaker for the Department of Surgery faculty retreat, which is focused on physician wellness. Dr Mark Clemens of MD Anderson Cancer Center will be visiting us in November. Have any faculty or residents won awards over the past year? Kristen Rezak, MD, received a Hope Award from the Susan B. Komen Foundation at its 24th Annual Northeastern New York Survivor Luncheon in April. Dr. Rezak was honored for the significant impact she has made in the lives of breast cancer survivors in the Capital Region. Dr Seun Adetayo was selected among the 40 under 40 by the Albany Business Review in honor of her dedication and hard work establishing the Cleft-Craniofacial Center at the Bernard and Millie Duker Children’s Hospital. PGY-3 Resident James Drinane was awarded a scholarship to attend the ASSH annual meeting in September 2018. How many graduates do you have each year from your program? We will have one graduate in 2019 and two each year beginning in 2020. What are the names of your current and recent graduating residents/fellows and what are their current plans/positions? We were approved to start a new integrated program, and will be participating in this year’s match to start in July 2019. The plan is to phase out the independent program over a 6 year period. New faculty member: Dorothy Bird, MD. Amy Moore- Feb 2018 Washington University. Are there any research projects or grants which have been received which you would like to share with the membership? Steve Bonawitz is involved in a research project looking at canabanoids and their effect on microvascular surgery and stem cells. Dorothy Bird will be reactivating research she started during her residency on Epigenetics of stem cells in regenerative medicine in breast cancer patients. Kate Rodby MD was the recipient of an ASPS travel scholarship to attend the Annual Meeting. Martha Matthews was the recipient of Cooper University Hospital Senior Physician of the Year. Leslie Cohen Joined the faculty in August 2018 after completing her residency with us and completing the Microsurgery Fellowship at NYU. Her focus will be on Microsurgery and Transgender surgery. Dr. Gabriel Del Corral is the Director of the Franklin Square rotation in Baltimore. Dr. Del Corral was in a very busy private practice and has joined our department incorporating his practice and skills into the residency. Dr. Laura Tom is a new faculty member at MedSTAR Washington Hospital Center. Dr. Tom trained in Seattle at the University of Washington and will be officially joining our faculty in September 2018. Dr. Zachary Martin of Good Samaritan Hospital in Baltimore has been at Good Samaritan and has moved into our department this year. The MedSTAR department of plastic surgery has initiated a microsurgical fellowship that started this year with its first fellow, Dr. Ken Fan. The fellow will work primarily at Georgetown University Hospital as well as Washington Hospital Center; however there will also be an opportunity to work in the Baltimore region as well. The microsurgical cases will include lower extremity, lymphatic, breast, head and neck, and general microsurgical reconstruction. Any plastic surgery residents interested in the microsurgery fellowship should contact our department for information regarding the application process. A new rotation for the residents has been set up in Baltimore at Franklin Square Hospital. This is a busy microvascular surgery service with 2 new faculty performing high-volume microvascular cases. This is also close to the Curtis national hand center which is another MedSTAR hospital that affords the residents the opportunity to do fresh cadaver dissections as well as a microvascular skills lab on live animals while on their Baltimore rotation. The residents are excited for the new Baltimore rotation as they have a beautiful 2 bedroom apartment with a swimming pool, exercise center, and on-site recreational lounge at the living facilities. Additionally we have opened our new McLean, Virginia office which is a combination of women's health and plastic surgery in downtown McLean Virginia. We are also excited to be completely renovating our Georgetown Department of Plastic Surgery clinical facility and we have started the initial stages of construction of a brand-new hospital that will future 35 new operating rooms and over 150 private patient rooms. Dr. Stephen Baker completed his term as president of the American Society of craniofacial surgery at the past annual meeting. We currently graduate 3 residency/year. However starting in 2018 we have begun matching 4 residents per year. 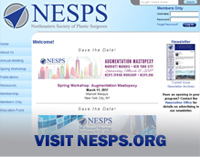 Is there anything else about your program that you would like to share with the NESPS members in the next newsletter that is not mentioned above? As Dr. David Song expands the presence of MedSTAR plastic surgery in the greater DC Metropolitan area, including Baltimore and Virginia, job opportunities will be available. If any members of the Northeastern Society of Plastic Surgeons are aware of exceptional candidates looking for a position in the Washington DC area, please have them contact Morgan Gonzales within our department at 202-444-8751. Dr. Edward (Chip) W. Malin, MD will join the BIDMC plastic surgery faculty in January, 2019. Dr. Samuel Lin is Program Director of the BIDMC/HMS Plastic Surgery Residency Program starting in July, 2019. Lydia Helliwell, MD, joined the faculty of the Division of Plastic and Reconstructive Surgery in September 2017 and is an Instructor of Surgery at Harvard Medical School. On July 1 2018, she was appointed the Site Director. Andrea L. Pusic, MD, was named the Chief of Plastic and Reconstructive Surgery for Brigham Health in March 2018. Dr. Pusic is Co-Director of the newly formed Patient-Reported Outcomes, Value & Experience (PROVE) Center as well as President-Elect of the Plastic Surgery Foundation and the Joseph E. Murray Professor of Surgery at Harvard Medical School. Chris Gibbons, PhD, joined the faculty of the Division of Plastic and Reconstructive Surgery as an Investigator in March 2018 as Co-Director of the Patient-Reported Outcomes, Value & Experience (PROVE) Center and is a Member of the Faculty at Harvard Medical School. Dr. Stephanie Caterson was appointed an Associated Program Director on July 1, 2018. Dr. Kyle Eberlin was appointed an Associate Program Director on July 1, 2018. In January, 2018, BIDMC was approved by the ACGME for an Independent Plastic Surgery Residency Program. The program will have its first two residents starting in July, 2019. Dr. Munique P. Maia graduated from the BIDMC Aesthetic & Reconstructive Plastic Surgery Fellowship. She accepted an appointment in a private Aesthetic & Reconstructive Practice, in the Washington, DC Area (McLean, VA). Dr. Andreas Lamelas graduated from the BIDMC Breast Reconstructive & Microsurgery Fellowship. He accepted a private practice position in Connecticut. Dr. Brady A. Sieber, a graduate of the combined Harvard plastic surgery residency program. Develop new measurement tools and techniques. Transform patient-reported data into actionable insights. Integrate innovative new systems to simplify data collection. Demonstrate the value of PROMs (Patient-Reported Outcomes Measures) for clinical practice, outcomes research, benchmarking and quality improvement. Oren Ganor, MD, has established the Center for Gender Surgery at Boston Children’s Hospital, the first pediatric center in the country dedicated to the surgical care of transgender patients. Dr. Catherine Chang graduated from the MGH craniofacial surgery fellowship and has joined a private practice in Los Angeles, California. Dr. Matthew McLeod graduated from the MGH breast/aesthetic surgery fellowship and has joined a private practice in Savannah, Georgia. Dr. William Knaus graduated from the MGH hand surgery fellowship and has accepted an academic faculty position at Emory University in Atlanta, Georgia. BIDMC Plastic Surgery held its first annual international Lymphedema Symposium in November, 2017. About 250 people attended the conference. The second annual conference, held at the Joseph B. Martin Conference Center at HMS, will take place on November 2-3, 2018. The conferences also include a patient symposium. Dr. Dhruv Singhal was the key organizer of the conference. Dr. Joseph Upton was the Robert M. Goldwyn Visiting Professor in April, 2017. BIDMC is hosting the 5th annual Microvascular Oncology Course in December. Dr. Bernard Lee and Dr. Samuel Lin are organizing this meeting. BWH will host Dr. Gregory Dumanian in March 2019 as the Harvard Plastic Surgery Residency Visiting Professor and Joseph E. Murray Lecturer. The MGH hosted Dr. Chris Pederson as the combined Plastic Surgery / Orthopaedic Surgery Hand Surgery Visiting Professor. Dr. Dhruv Singhal, and his research team, obtained two grants for their ongoing work on lymphedema and lymphatic surgery. Goal: Establish a scaffold with variable rigidity to bridge composite muscle/bone lower extremity defects. Goal: Investigate whether loss of hypoxia signaling limits skeletal muscle regeneration in a murine model of aging. Arin Greene, MD, MMSc: Dr. Greene recently was awarded an NIH R01 grant to study arteriovenous malformations. He also has an NIH R01 titled “Capillary malformation: From somatic GNAQ mutations and disrupted endothelial biology” and 2 NIH R21 grants: “Determining the mechanism for infantile hemangioma: follicle-stimulating hormone” and “Determining the mechanism for arteriovenous malformation”. He is a Co-Investigator on an NIH R01, “Vascular niche bioengineering for human bone regeneration” and has additional funding through the Translational Research Program at Boston Children’s Hospital. Carolyn Rogers-Vizena, MD, received a K National Endowment for Plastic Surgery grant to study "high fidelity simulation for education and competence assessment in cleft lip surgery. Dr. Eric C. Liao, MD PhD was named the prestigious Tengalia MGH Research Scholar, in recognition of his contributions in investigative and collaborative research. His lab recently reported functional analysis of IRF6 mutations in orofacial clefts, demonstrating that functional tests are imperative in human genetics. Dr. Richard Ehrlichman MD has received IRB approval for a large investigational study investigating the use of CO2 laser therapy on chronic wounds. Dr. Bernard T. Lee was appointed a Professor of Surgery at HMS. Dr. Donald J. Morris was the 2018 recipient of the Julian J. Pribaz, MD Teaching Award from the Combined Harvard Plastic Surgery Residency Program. 2018 Robert Ebert Prize for Health Care Delivery Research or Service. 78th Annual Soma Weiss Student Research Day. Racial Disparities in Complication Occurrence Among Lower Extremity Trauma and Flap Reconstruction Patients. Matt Carty, MD, received the Julian J. Pribaz teaching award. Arin Greene was promoted to Professor of Surgery. Dr. William G. (“Jay”) Austen MD was promoted to Professor of Surgery. Dr. Kyle R. Eberlin MD was selected as the 2018-2019 American Society for Surgery of the Hand (ASSH) Plastic Surgery Visiting Professor, and was also named to the ASSH Young Leaders Forum. He was named the Junior Director-at-Large for the American Association for Hand Surgery (AAHS) Board of Directors from 2018-2020. In addition, he has been named the Vice Chair of the Hand Surgery Committee for the Annual ASPS Meeting Educational Program. Dr. Eric C. Liao MD PhD was named a section editor for the American Cleft Palate Association Journal; and his review “CRISPR Craft, DNA Editing the Reconstructive Ladder” will be featured on the cover of the upcoming November 2018 issue of Plastic and Reconstructive Surgery. Dr Yaremchuk was the 2018 Wilhelmsen Lecturer in the Craniofacial Sciences, Thursday May 17, 2018 at the Johns Hopkins School of Medicine, University of Maryland School of Medicine, University of Maryland School of Dentistry. Has your program held any events or hosted any speakers over the past year, which you would like to share with your colleagues? We were honored this past year to host Dr. Amy Colwell as our Annual Arthur Barsky Lecturer in the winter and Dr. Mark Urata in the in the spring. Are there any coming up in the fall or winter? Our Barsky lecturer for this year is Dr. Christopher Attinger, MD of Georgetown. Plans after residency/fellowship: Transgender fellowship in Chicago with Loren Schecter, MD. Plans after residency/fellowship: Craniofacial fellowship at Miami Children’s Hospital with S. Anthony Wolfe, MD. Is there anything else about your program that you would like to share with the NESPS members in the next newsletter that is not mentioned above? Dr. Taub will serve as the Chair of the American Society of Maxillofacial Surgeons and Chair of the Northeastern Society of Plastic Surgeons this coming year. No, except one surgeon on medical leave. Dr. Guo was given the Dean’s Most Outstanding Mentor Award by the School of Medicine at Tufts University. Plans after residency/fellowship: Johns Hopkins, MPH, MD Anderson microsurgery fellowship. On staff at MD Anderson. We have recently converted half of our Independent program to Integrated track. So now we have dual tracks of one each, meaning six Integrated and three Independent residents at any given time. We participate in both matches. Dr. Yee-Cheng Low, MD has been appointed to the teaching faculty this past year. He brings his microsurgical skill and training from the Vanderbilt and has been an invaluable addition to the program. The addition of two plastics surgeons to the teaching faculty. Dr. Maurice Nahabedian, MD participated as a visiting professor to LVHN this past year. Plans after residency/fellowship: Completed his microsurgery training at Stanford and is currently helping to develop a plastic surgery residency at the University of South Carolina as an Assistant Professor of Surgery. Plans after residency/fellowship: Previous microsurgery fellow at Fox Chase Cancer Center in Philadelphia, and recently took an appointment as faculty as Assistant Professor of Surgery at Fox Chase Cancer Center. Plans after residency/fellowship: Most recent graduate of the LVHN plastic surgery program and is currently doing a microsurgery fellowship at Memorial Sloan Kettering in NYC. Plans after residency/fellowship: Current chief resident of the LVHN plastic surgery program and will be completing a Hand, Upper Extremity, and Microsurgery fellowship at the University of Maryland / Shock Trauma Center Program. Plans after residency/fellowship: Current fifth year resident of the LVHN plastic surgery program and will be applying to microsurgery programs this year. Name: Robert Teixeira, MD - Current fourth year resident of the LVHN plastic surgery program. Name: Mamtha Raj, MD - Current third year resident of the LVHN plastic surgery program. Name: Andrew Steele, MD - Current second year resident of the LVHN plastic surgery program. Name: Ahmed Mansour, MD - Current first year resident of the LVHN plastic surgery program. Dr. Edward Davidson who graduated from a craniofacial fellowship at Johns Hopkins joined the full-time faculty in July 2017. Dr. Matthew Treiser who graduated from a Hand Surgery fellowship at MedStar Union Memorial – Curtis National Hand Center, joined the full-time faculty in September 2018. Dr. J. Alejandro Conejero left the full-time faculty in June 2018 to return to Chile. We are phasing out the independent residency program and currently have two senior residents and 2 chief residents remaining. In its place, we will have a six-year integrated program, which currently has two residents in each of the PGY1, PGY2, PGY3 and PGY4 years. Drs. Evan Garfein and Oren Tepper established the Montefiore Einstein 3D Laboratory in the use of medical 3D imaging and modeling. Clara Lee, MD, PSF Visiting Professor, The Ohio State University. Lectures: 1) How to Obtain Research Funding and 2) Do Patients Make Good Decisions about Breast Reconstruction? Carrie Stern, MD, Chief Resident, received the 2018 Leo M. Davidoff Society Award of the Albert Einstein College of Medicine for outstanding achievement in the teaching of medical students. This past year we had three residents graduating. Going forward we will have two residents graduating each year. Plans after residency/fellowship: Cleft and Craniofacial Pediatric Plastic Surgery Fellow at The Children’s Hospital of Pittsburgh, University of Pittsburgh Medical center. We have a thriving transgender program. We have the pleasure to announce the addition of two new first year Plastic Surgery residents, Caroline McLaughlin from Virginia Tech Carilion School of Medicine, MD and Andrea Hiller, MD from Louisville School of Medicine; they began with us July 1, 2018. We welcomed a new program coordinator, Sarah Wallace, April of this year. We have hosted three visiting professors in the past academic year, Dr. Chris Forrest, Dr. Sheri Slezak and Dr. Roger Levin. For the 2017-2018 academic year, we are scheduled to host Dr. Zin on November 1, 2018 and Dr. Neligan on November 29, 2018. Donald Mackay, Thomas Samson and Cathy Henry are participating in the Cornet Cleft Outcomes Registry, an NIH funded, multi-center study which will track specific outcomes such as fistula rates and speech outcomes amongst the nineteen participating centers. Dr. Dino Ravnic won 1st Place Clinical Science Presentation at the 64rd Annual Scientific Meeting of the Robert H. Ivy Society of Plastic Surgeons, 2018. Ashley Leberfinger won 1st Place Clinical Science Presentation at the 64rd Annual Scientific Meeting of the Robert H. Ivy Society of Plastic Surgeons, 2018. Jeffrey Fornadley PGY 1 won the Ballantine Award for Surgical Residents. We have two graduates each year. Plans after residency/fellowship: In July 2018 she will be transitioning to a Fellowship in Hand and Upper Extremity Surgery at the University of Pennsylvania. Plans after residency/fellowship: In August 2018 she will be transitioning to a Fellowship in Microsurgery at the University of Pennsylvania. The Division of Plastic Surgery has hired Dr. Jonathan Leckenby, a fellowship-trained microsurgeon from the UK. He has outstanding credentials and has a clinical interest in facial nerve repair as well as brachial plexus injuries and lower extremity reconstruction. These are areas in which our resident corps relates relatively low numbers related to their cases minimums. Dr. Leckenby also brings with him a dedicated basic science lab with grant funding. This represents a tremendous addition to the Division as well as to the residency program. The Division of Plastic Surgery has hired Dr. Elaina Chen to join the clinical faculty. Dr. Chen brings with her a tremendous experience in general plastic surgery with a specific focus on wound healing, general reconstruction and breast reconstruction. There has been formalization of a 7 week microsurgery curriculum under the guidance of Dr. Leckenby and Dr. Christiano. The curriculum is comprised of single day sessions for 7 weeks during which the residents participate in microsurgical practice under the direct guidance of Dr. Leckenby. There is graded responsibility culminating in 2 weeks of live surgery on rats in the lab. This microsurgery experience is fully protected time for the residents where their pagers will be signed out and they will be excused from all clinical duties. There will be a pre test and a post test to measure the progress of the residents through this course. Dr. Ronald Bossert, the Program Director for the integrated plastic surgery residency program was awarded the prestigious Dean's Teaching Fellowship for 2018-2020. This fellowship is awarded to only 4 faculty members across the University enterprise. Dr. Bossert is the only surgeon to be awarded this distinction for the 2018-2020 session. His project will focus on best practices for establishing plastic surgical trainee competency and is entitled "Surgical Sport: Improving Surgical Education Through Task-Specific Skill Acquisition and Coaching"
Plans after residency/fellowship: Joined our Division of Plastic Surgery Faculty as Assistant Professor. We are investigating pain control in the breast reduction analysis of fat tissue. New faculty include Dr. Devra Becker, Associate Professor and former Program Director at University Hospitals Cleveland, brought to expand the clinical environment to our community hospitals in the region (i.e., UPMC Passavant); and Dr. Dan Murariu, Clinical Assistant Professor/Volunteer, expanding the clinical volume at the Allegheny General Hospital clinical site. Authorization by the Plastic Surgery RRC to initiate the Competency-Based Plastic Surgery Training Program – this represents a four-program consortium application to the ACGME Advancing Innovation in Residency Education (AIRE) pilot program, initiating an experimental program in competency-based, time-variable training in plastic surgery. Ohio Valley Society of Plastic Surgeons Annual Meeting – winner of the annual Ohio Cup 15 years in a row. Best overall presentation – Francesco Egro. Clinical trial to determine safety of allograft adipose matrix for soft tissue reconstruction. Best basic science presentation – Wendy Chen. Whole eye transplantation: allograft survival with tacrolimus immunosuppression and comparison to synergistic transplantation. Best poster presentation – Wendy Chen. Mandibular distraction and long-term dental morbidity. Best Overall Paper and the George Manstein Award - Chiaki Komatsu. Assessment of Retinochoroidal Circulation Using Fluorescein Angiography in Rodent Whole Eye Transplantation Model. First Place Basic Science - Joshua Barnett. FK506 Releasing Nerve Wraps Accelerate Nerve Regeneration. Second Place Basic Science - Asher Schusterman. Adipose-Derived Stem Cells Delay Muscle Atrophy after Peripheral Nerve Injury in the Rodent Model. Innovation Program Grant. $10,000 grant awarded by The Beckwith Institute. How many graduates do you have each year from your program? 3 graduate within the Integrated program and 2 within the Independent program. The 2018 academic year has been stellar for Rutgers Plastic Surgery. Both campuses – Robert Wood Johnson (RWJ) and New Jersey Medical School (NJMS) added new faculty members. Dr. Jeremy Sinkin at RWJMS completed his plastic surgery training at Georgetown University and a microsurgery fellowship at Memorial Sloan Kettering. Dr. Ashley Ignatiuk at NJMS completed his plastic surgery training in Ottowa and two hand fellowships – pediatric hand surgery at Scottish Rite and the hand surgery fellowship at UT Southwestern. Both new surgeons are welcome additions to the academic group with unique subspecialty training. This year we graduated our first class of Integrated Plastic Surgery residents - Dr. Laurel Karian Chandler and Dr. Alexis Lanteri Parcells. Laurel is pursuing an aesthetic fellowship in Boston. Alexis is joining Dr. Scott Spiro in private practice in New Jersey. We’re looking forward to seeing both of their careers develop and will miss them both. Our residency program has had a busy year. We’ve added an additional clinical site – St. Barnabas Medical Center in Livingston, New Jersey. We also welcomed Bao Tran who transferred into our program as a PGY2 resident. Our incoming interns include John Chao from Ohio and Amon Ra Gama from Tufts. Dr. Jonathan Keith at NJMS founded the Rutgers Center for Transgender Health. He has been a staunch advocate for transgender rights and is an expert in gender affirmation surgery. He performed the first phalloplasty in New Jersey at St. Barnabas Medical Center and hopes to follow with many more. Dr. Mark Granick opened the Wound Care Center at University Hospital. He leads a multisdisciplinary team including Dr. Oscar Alvarez, a well-known palliative wound care specialist. Together, they have pioneered the use of Skin TE and other wound care technologies. Dr. Edward Lee will be taking over as Division Chief as Dr. Granick pursues his clinical passion and research interests in wound care technology.